Each time I’ve contemplated trips to the Spiral Jetty—far out on the north end of the Great Salt Lake—the remoteness of the site deterred me. It’s such a commitment, I would tell myself. It’s such a drive, and the roads … aren’t the roads terrible? But when Westminster College invited the public on a caravan trip out to the Jetty on April 12, I knew that I had run out of excuses. The trip was the culminating event in an art project sponsored by Westminster’s Great Salt Lake Institute. The month before, visiting Japanese artist Motoi Yamamoto had drawn in salt across the floor of the College’s Meldrum Science Center, leaving a temporary web of white lines that looked embryonic, labyrinthian and mystical. In accordance with the artist’s wishes, the group of mostly students and professors had gathered the morning of the trip in the science lobby to sweep up the art and return it ceremoniously to the sea—in this case, the Great Salt Lake. Having arrived with no more than a sandwich, a water bottle and a hat, I was able to finagle a seat in a college van steered by Institute coordinator Jaimi Butler. We loaded up and I settled in for the ride. By the time we hit dirt about two hours later, I was starting to realize my good fortune. Butler, who has worked around and on the Great Salt Lake for more than a decade, was proving to be an unparalleled guide. Running a non-stop and fascinating commentary, she pointed to moving flecks that no one else would have noticed, naming them all. The little black dots in the sky turned out to be white-faced ibis. “You can tell,” she informed us, “by their v-formation flight pattern.” The equally small dots in the ephemeral ponds on the side of the road, just beginning to fill as the water table rose with spring runoff, were American avocets. “The Great Salt Lake is home to one of the largest breeding populations in the West,” Butler said. She pointed out turkey vultures wavering in circles overhead, pelicans flying purposefully across the sky and loggerhead shrikes flitting off through the sage. And finally, after 10 miles bouncing down a dirt road past cattle and their newborn calves, she pointed to the Spiral Jetty. The world-famous earthwork sculpture was created near Rozel Point in April 1970 by the American sculptor Robert Smithson. He took his materials from the very natural environment in which he set his unique amalgam of landscape and art: black basalt rock, white salt, grey mud, pink water. He chose the lake over other potential sites around the world because of the otherworldly effect of the landscape: the brown desert peaks thrusting up from the glassy lake surface, the pink hue of the water. Were it uncoiled, the jetty would stretch 1,500 feet long. At its widest, the coil measures 15 feet across. “I come out here all the time, but it’s never the same. Any little change in weather or time of year makes it look completely different,” Butler says as we climbed out from the protection of the van and into a sharp breeze. To the west, puffball cumulus clouds danced across the blue sky. To the east, a sheet of grey approached with veils of rain and virga descending over snow-capped mountains. The lake looked choppy and grey with a touch of lavender. Smithson, Butler had told us, had designed the Spiral Jetty while contemplating the lake from a dizzying perch behind Rozel Point. Eager to get the artist’s perspective, I set off along a worn trail up the face of the hill. From on high, an immense geographical circle became apparent. To the west stood the Hogup Mountains and Gunnison Island rising shallowly from the water. Then, to the south, the Stansbury and Oquirrh Mountains took their place. Sweeping up to the east I saw Antelope Island and the peaks of the Wasatch, which pulled my gaze finally to Promontory Point, jutting its bony finger out into the lake. 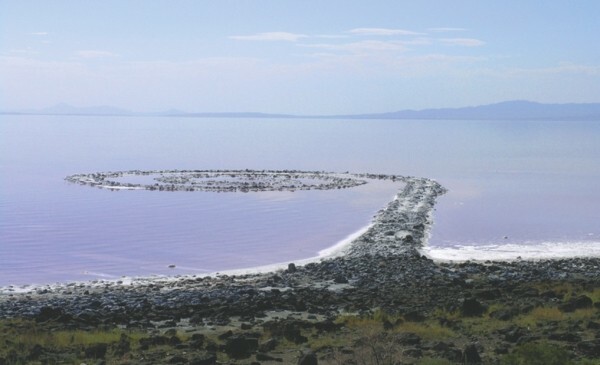 I looked down once more on the Spiral Jetty, seemingly ancient and as mystical as Yamamoto’s saltwork. My eyes swept once more over the path of the circle following Jetty’s black arms, and the spiral suddenly made eerie, beautiful sense.